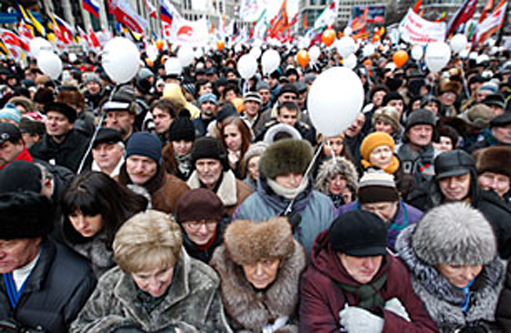 Regardless of the occasion, it is always humbling to see 60,000 people gathered in a single square, and it was no different on Saturday, Dec. 24, when at least that many gathered on Moscow's Sakharov Avenue to demand democracy, humility and respect from the Russian government. But the size of the crowd, which was larger than any demonstration the city has seen since the fall of the Soviet Union, was not as astounding as the composition of the crowd. Among the protesters, practically at random, you could expect to run into doctors, lawyers, engineers, big businessmen, small businessmen, academics, poets, filmmakers and students from every imaginable faculty of Russia's best universities -- not quite "the masses" of Russian society. Looking out onto a sea of them on Saturday, one had to wonder, Where they have been all this time? The answers to be heard at Saturday's rally were as diverse as the crowd itself, but they could be distilled to one potent Russian word: dostala, which means, "I'm sick of it." They were sick of not being given a choice of their country's leaders. They were sick of corruption and political paternalism. Unlike many of their counterparts in the Arab world, who rose up this year to overthrow dictators in Tunisia, Egypt and Libya, these people were not sick from want and unemployment. "This is not an economic protest," says Maxim Yermolin, the general director of a marketing firm who attended Saturday's rally. "These people are well fed and financially secure. They've had a chance to travel around. They've seen that in Europe a government is not some godlike power. It is a set of managers you hire for a while and then fire when they cease to be efficient. They want Russia to be like that too." But right now that seems more like a bargaining position than a political platform. With Putin still in control of the armed forces and the police, only a very small segment of his opponents want to risk pushing him into a corner. "Our goal is not to kick this or that person out of power," Grigory Yavlinsky, the founder of the liberal Yabloko party, said from the podium on Saturday. "Our goal is to change the system." And with the people suddenly willing to take to the streets in protest, the Kremlin has started slowly moving toward reform. Putin's protege, Dmitri Medvedev, who will step down as Russia's President in March, proposed laws to the parliament on Friday that would allow new political parties to register more easily. During his final state of the nation address the day before, he said, "I hear those who speak of the necessity of change, and I understand them." But the mechanisms the government is using to respond to the clamor for change amount to more of Putin's system of "managed democracy." According to TIME's sources in the United Russia party, the regime intends to create new puppet parties that would fracture and distract the opposition. These would be led not by independent figures like Navalny but by old-time Putin loyalists, two of whom attended Saturday's protest to shore up their popular credentials. Neither received a pleasant welcome. Alexei Kudrin, Russia's former Finance Minister and an old friend of Putin's, was booed and whistled at when he took the stage; while Mikhail Prokhorov, the billionaire owner of the New Jersey Nets who claims to be challenging Putin for the presidency, was heckled viciously as he walked through the crowd. One member of his entourage got punched in the face. "The people are not stupid," Boris Akunin, an acclaimed novelist who spoke at the demonstration, told TIME afterward. "They have been quiet all these years because they were coming of age. But they are adults now. They are smart and vocal, and they have reached a critical mass." That is the ultimate lesson of Saturday's demonstration. For the first time since the collapse of communism, a truly vibrant civil society has erupted onto the scene, and it is demanding real democracy, not managed democracy. This is a political playing field that Putin's elite has never encountered before, and nobody knows how or whether it will be able to adapt. "Society has awoken from a long hibernation," says Mikhail Fedotov, the chairman of the Kremlin's human-rights council. "So it turns out we aren't like bears. We are not going to sleep this winter."